Discussion in 'Music Corner' started by Steve Hoffman, Jan 30, 2016. Desk setup was probably the best. In no case was it something that would have "jumped out" at me as highly unusual, but I was able to hear it - slight reverb, especially on the word "feeling." Thank you. I didnt know that. Ordered this compilation after reading this thread. Great collection! Too bad there aren't any credits in the booklet. I'd like to know who's playing the trumpet on (You Know It All) Smarty. If you look at the booklet images, I guess that those are the recording dates mentioned. 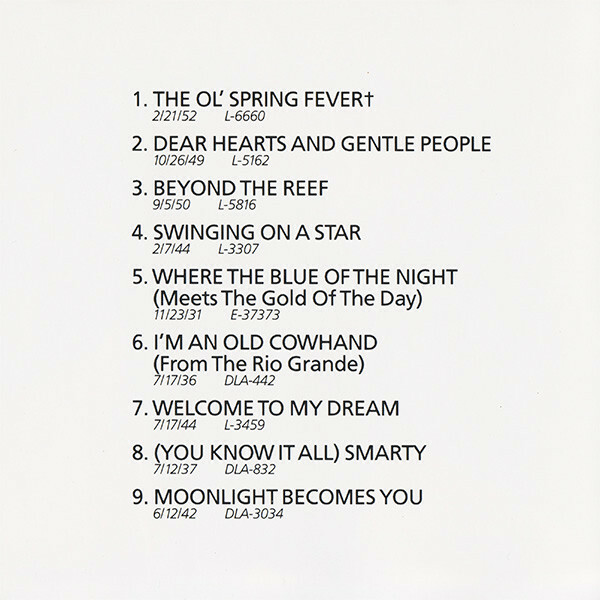 What's the catalog number provided for each song? The price is a bit up since the original post. I spent $10 on a VG+/NM copy. This set is wonderful-especially at midnight. Started with You Are Too Beautiful. Closed my eyes in the darkened room and heard the “bloom”/reverb sound. Wonderful. I’ll bet you had fun putting this one together. And thanks for the heads up. I’ll keep this disc handy as I play with future equipment upgrades/changes. 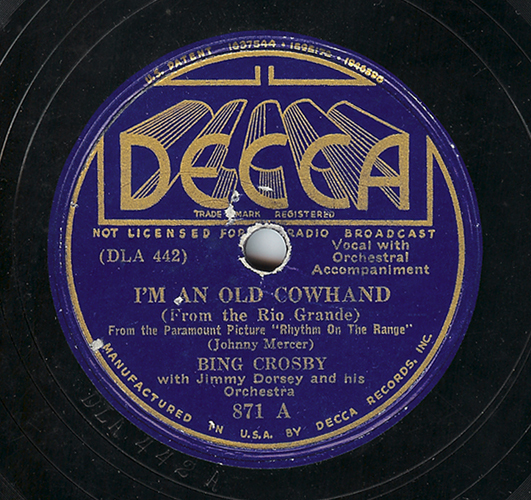 As the Decca label says, the Cowhand song is from the Crosby movie "Rhythm On the Range." Anyone who watches the movie (used and perhaps some new DVD & VHS copies are out there) is treated to a much longer version of the song, performed by Bing and other ranch characters around a campfire -- including a trumpet solo by a very young and skinny Louis Prima! Anyway, it's a bit late now to play this disc on my systems to listen for the 0:27 midrange test, but I'm looking forward to trying it out tomorrow! I gave it a good listen, and while the echo effect is more audible when I turn it up louder, it's still as not dramatic an effect as I was expecting. So far I've only listened to this on one of my two systems, but it's the one that is actually more tonally pleasing to my ears, so I'm not expecting any better result on my other system. So my conclusion is that I have some clear potential for future upgrade benefits. This is something I can aim for in future years. I wish I could afford to get the locally-available used McIntosh MC 2205 to insert into that same system. I'd start by relegating my Denon AVR-3801 to pre-amp duties, by enlisting the MC 2205 as the amplifier driving the Elac Debut B6 speakers. I also suspect that my Monster cable speakers wires are contributing to the lack of midrange magic in my preferred system (I have a pair of Grover speaker wires but they're too short for this system, so I have them in my other system). I bet spending around $2k on McIntosh MC 2205 and better speaker wires would get this system closer to midrange magic. ... And if not, I'd probably think about replacing those Elac speakers next. Or retiring my Denon receiver and getting a dedicated pre-amp. Because our hobby never ends. Thank you, Steve, for sharing this easy demo disc example with us, as a way to quickly see how our system(s) performs in the midrange band.